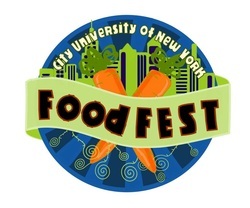 CUNY FoodFEST 2011 is the second annual food justice event put together by CUNY students. Taking place on October 23rd and October 24th, it is a two day event for CUNY students and the general public focused on educating and engaging participants in stimulating conversation about various topics in the food justice movements. On Sunday the 23rd at the Macaulay Honors College, students will attend workshops, cooking lessons, and meet with various food justice organizations from around the city. Workshops will be led by experienced members of the food community, including Mimi Sheraton, renowned food critic for the New York Times and Time Magazine, and Joel Berg, author and leader in the fields of hunger and food justice. There also will be cooking lessons, a highlight from last year’s FoodFEST, where three chefs will come and teach participants healthy and easy recipes to do at home for a nutritious and delicious meal. Other activities include preparing meals for homeless people, yoga, art, and a puppet show. On Monday the 24th, National Food Day, there will be various campus events around New York City including Challah for Hunger at Queens College, agri-CULTURE, a Food Film Series at Medgar Evers College, and many others organized by on campus food activists. Please check the left tab for more information about the events on Monday the 24th. This event is funded by the William R. Kenan Leadership Scholars Program at CUNY. please use the contact tab to the left.